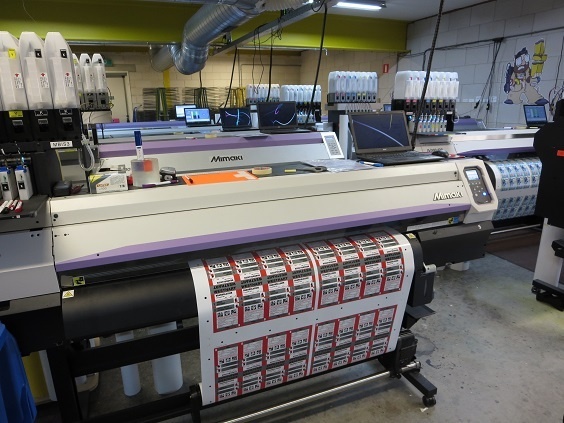 stickerkoning, The Netherlands | Mimaki user stories | Case Study | MIMAKI SINGAPORE PTE. 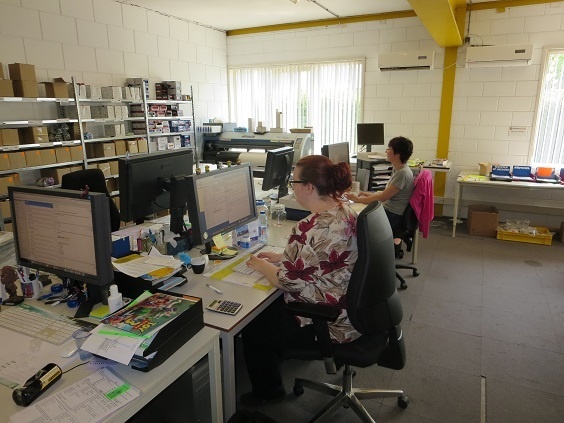 LTD.
stickerkonig is expanding its business by online printing service. Stickerkoning is a label printing company founded in 1986. Its head office is located in Veldhoven, a city 125 km away to the south from Amsterdam, the capital of the Netherlands. The company has originally produced labels and stickers with screen printers. The word “koning” in its name means “king” or “monarch” in Dutch. This fact implicates that the company aims to become the king in sticker production. Stickerkoning has introduced Mimaki Engineering’s inkjet printers in recent years, realizing small-lot production. It has opened a print mail-order site for end users, “stickerkoning.nl,” and expanded its market area to the whole area of Europe. Its presence is thus getting greater. 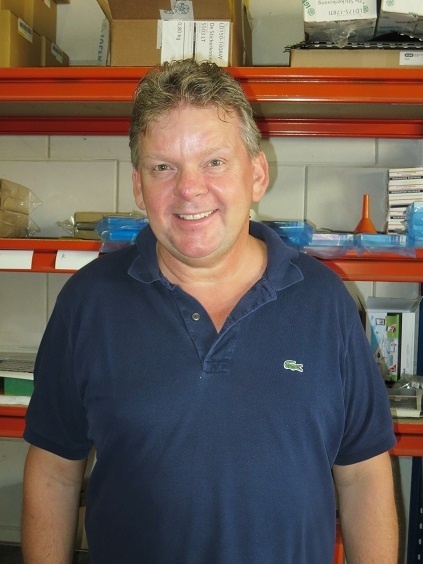 When Mimaki Engineering visited the company, Director RonVermeulen showed us over its head office and factory. 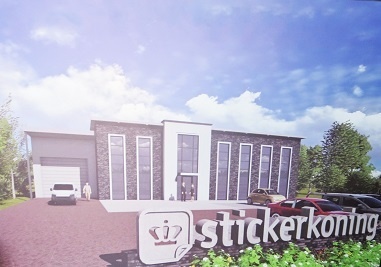 Stickerkoning generally receives orders for small-lot production. However, it does not focus only on limited product types. It provides various types of base materials, such as metalized paper with metallic texture, polyester, water-resistant synthetic paper, fluorine coated materials, fabric, and removable self-adhesive sheets. 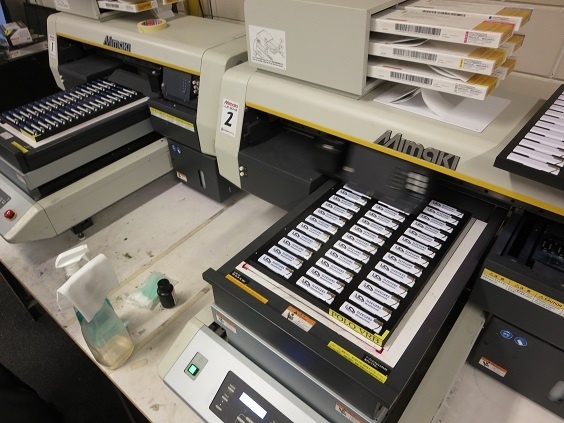 It also produces products for a variety of types of applications, such as barcodes and discount-price labels used at shops, attention-getting fluorescent stickers/labels and reflecting stickers/labels, and resin domed stickers. Labels and stickers for which print mail-orders are received are sent to areas all over Europe at no shipping charges. This free shipping is a factor that contributes to the high popularity of the company. The head office and factory are so small that the factory looks like a small-scale factory. Director RonVermeulen said, “I’m sorry for these small facilities.” However, many products are shipped from this place to areas all over Europe. A new head office and a new factory are actually under construction, and excavation is underway in the parking space in front of the entrance of the company. We have heard that since the present factory is small for production, it will be expanded. This fact suggests that Stickerkoning is growing in business. This company uses 11 Mimaki’s inkjet printers consisting of “JV150-130” and “JV33-130” (R to R wide-format inkjet printers). To our surprise, as many as 11 printers are placed on one floor and controlled by one operator. Stickerkoning has introduced a unique process control system to “visualize” work with computers. Jobs for received orders are distributed to the printers. This process control system allows 11 printers to be controlled by only one operator; after printing is completed, the operator can concentrate on roll cutting and arrangement for the next process. Receiving orders from throughout europe via internet. For stickers, labels, and other products for which orders are received from areas all over Europe, the volume of a lot in one job is frequently as small as 1000. In some case, the volume is one. Such jobs can be complicated, but by power saving, automation, and visualization realized with Mimaki’s inkjet printers and the process control system, the company securely copes with them. Stickerkoning also uses flatbed inkjet printers. It uses “JFX200-2513,” a wide-format flatbed UV curable inkjet printer to print on materials including slightly large stickers like warning labels, POP products for the shop fronts of retailing stores, and thick magnet products. It also uses two “UJF-3042” compact UV curable inkjet printers to print names on 3-dimensional objects, such as lighters and ballpoint pens. These goods are also in great demand. Orders are received not only from general people and small shops but also from large companies in the Netherlands. 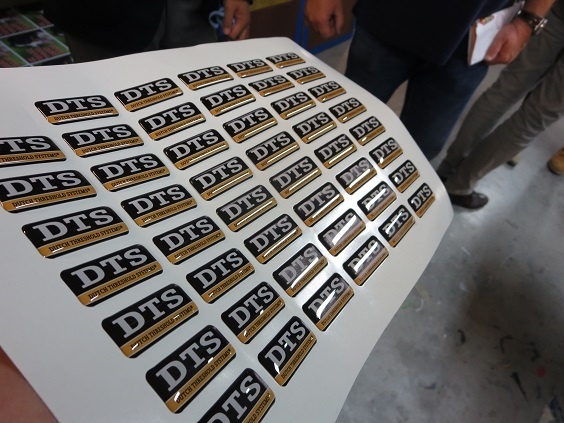 The company has been expanding the range of orders from stickers to other items. 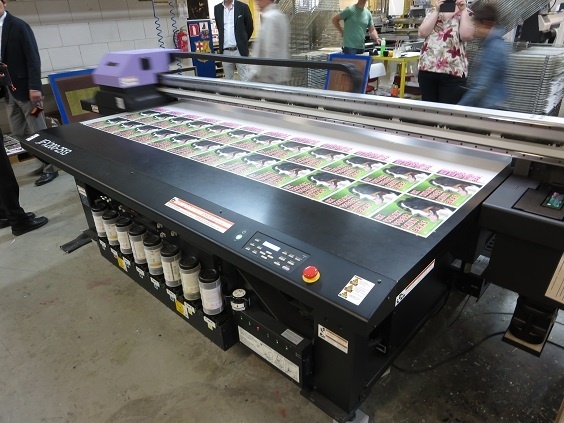 The flatbed inkjet printer is used for making large size stickers. Small goods such as lighters are printed by UJF-3042. Stickerkoning is also excellent in doming. Doming is a technique that provides 3-dimensional effect on stickers/labels surfaces by applying transparent resin. It adds values to stickers/labels. This technique is compatible with inkjet print products and creates attractive appearance at low cost even in small-lot production. 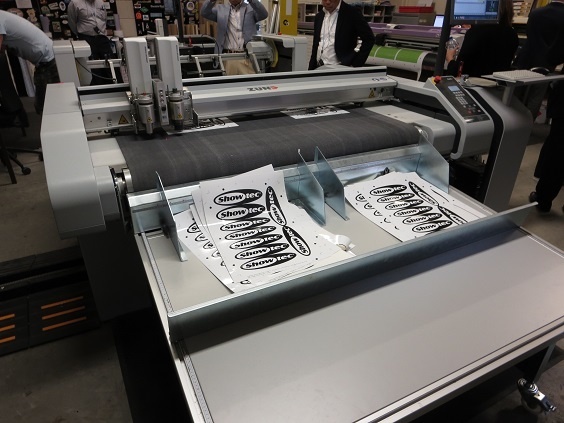 Many production processes on the cutting plotter are automated by using a robot arm. Stickerkoning has automated part of cutting operation (clipping) that is performed after printing. A robot arm carries prints by using a vacuum pad on to the plotter with a conveyor and these are automatically clipped and stacked. In Japan, the print is generally placed onto a cutting plotter by hand. However, the automation of such work is advancing in Europe, where labor costs and social security expenses are high under the strict Labor Standards Act.